Guest post on InsideView.ie by sports management student Fiachra Cotter. My proudest moment and my personal best was when we won the treble with Abbeyfeale United. In what was a long and arduous season for each member of the squad, each player can proudly say we dominated the league and we went from Christmas onwards without losing. The season kicked off on the 21st of April. A much anticipated game between the two top teams for the previous year. Abbeyfeale United vs Rathkeale fc. In an extremely physical game with many hard challenges and physical confrontations Abbeyfeale ran out with a 3-1 win. It was a great start to a historic season for Abbeyfeale. 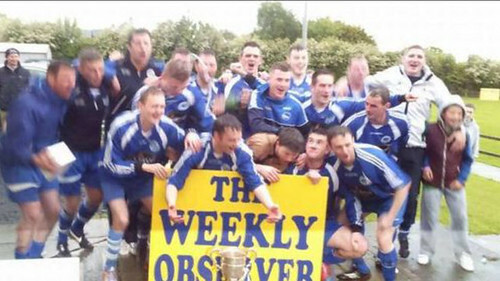 Within the coming nine months Abbeyfeale would complete a triple winning the league and two cups in the premier division. While also reaching the semi-final in the Munster Cup and the quarter-finals in the FAI cup which includes teams from all over the country. Guest blog post by Padraig O'Connor. It was the Minor A hurling final between Kilmaley and Feakle/Kilanena in Cusack Park in Ennis on the 27th of September 2014 and it was a day I won't forget. This was our third Minor A hurling title in six years, while also reaching our third final three years in row and winning two out of the three, so we were a very successful team. We won in 2012 and lost in 2013 so we knew what both winning and losing felt like, I guess this was an advantage going into the 2014 final. We had great trainers and coaches behind us which was a huge benefit. Photo snapped along the wet Abbey River in Limerick. 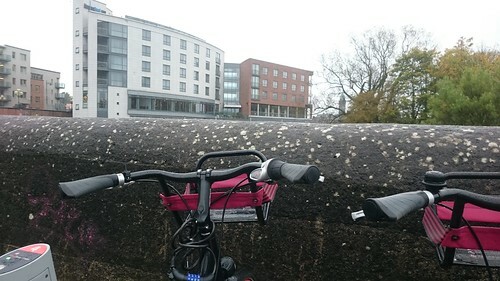 I RENTED MY FIRST wheels from BikeShare.ie and survived several self-induced snags to return again. Insideview.ie guest post by Janet O'Carroll. Part of the Digital Media module at the Limerick Institute of Technology (LIT) involves creating a peer review. This post considers the LinkedIn profile of Gillan Piveteau. 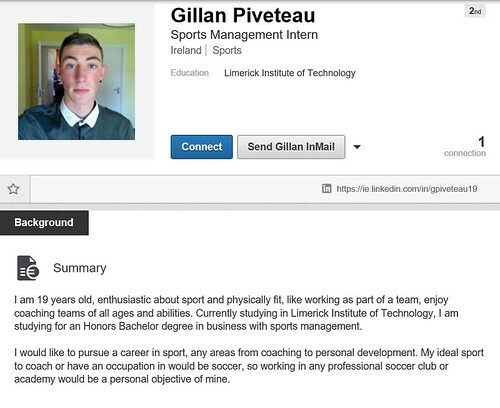 Gillan created the profile as part of an assignment from the Business Degree with Sports Management in LIT. Gillan set up his initial profile well. He arranged his achievements, awards and skills in a professional manner. He wrote a clear summary about himself and describes his aspirations in a manner that gives a great insight to his personality. His profile picture is a clear and well-lit headshot of him well-dressed. Guest blog post by Sports Management student Katie Hennessy. To be successful, to reach the top and most importantly to stay at the top. You need to be fit. It's non-negotiable for highly successful people. You can motivate yourself to reach your dreams, to be the person you always wished you would be, whether that be a business manager of a well known firm or even the owner of a successful business you built up yourself. You will only stay successful if your keep your head clear of all weakness. Most people when they want to clear their head get active, pressure their bodies rather than the mind. Rather than going by themselves they go with a friend outside the workplace. Then come back to the office ready to go again new ideas and a new frame of mind. Anyone can reach the top but to stay at the top is the hardest part. Most if not all successful business men like Howard Schultz, chairman and chief executive officer of Starbucks, keeps their fitness levels at the very top as well as their businesses. Mark Zuckerberg, Facebook CEO, doesn't take meetings sitting down in the office--he takes people out for a walk to discuss business. These people work hard to get their business to strive and do everything in their power to do so. And judging by their success in business, keeping fit is definitely a key factor. I admire people at the top of their game in business and I believe their approach to a healthy lifestyle is changing the way people improve the way they think by simply getting bit of fresh air. Guest post by Colm Coughlan. Image from Clare Herald. The day was 7th May 2007, the evening of the Shield Final between Cratloe and Ennis town. Everyone from the village of Cratloe made the short drip up to Lees Road to watch a game that would go down in the history books. Cratloe had not seen a day like this for a long time and nor would they have foreseen the result. I GET THRILLED by watching illegal and dangerous messenger racing. 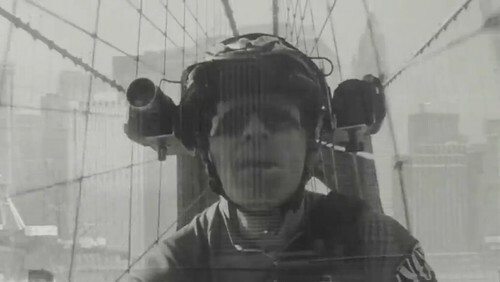 The ultimate DVD, recorded by helmet cams, drops on the first of July.